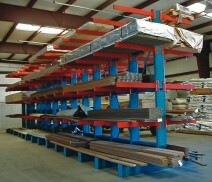 Another form of pallet racking is “cantilever racking”. 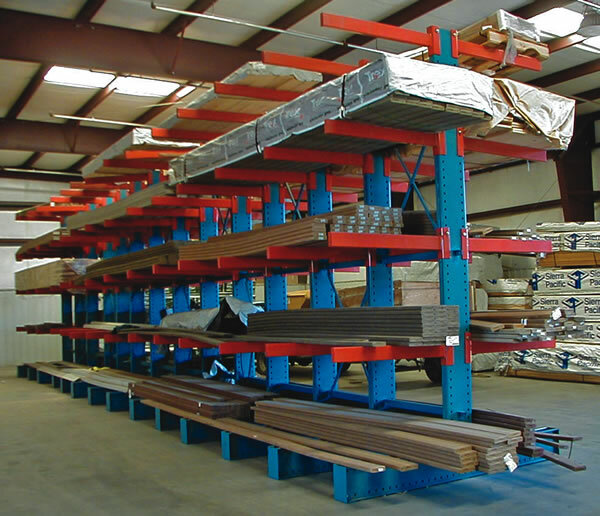 The benefit or purpose of cantilever racking is to both increase selectivity as well as space efficiency where long loads are stored. It is the ideal choice for long loads of wood, plastic or steel and can be designed to be either single or double sided. It’s structure typically consists of a footing which supports an upright column which will support the load arms branching out to support the rated load. Each column is connected to the other by way of either cross braces and/or horizontal braces with the design as a whole meeting the local seismic requirements of the region. Although virtually any lift truck can interface with cantilever stored product, due to the desire of maximizing space efficiency, most operations will typically favour the usage of specifically designed lift trucks or overhead cranes. Some examples of these lift trucks are Side loaders, and 4 – Directionals.